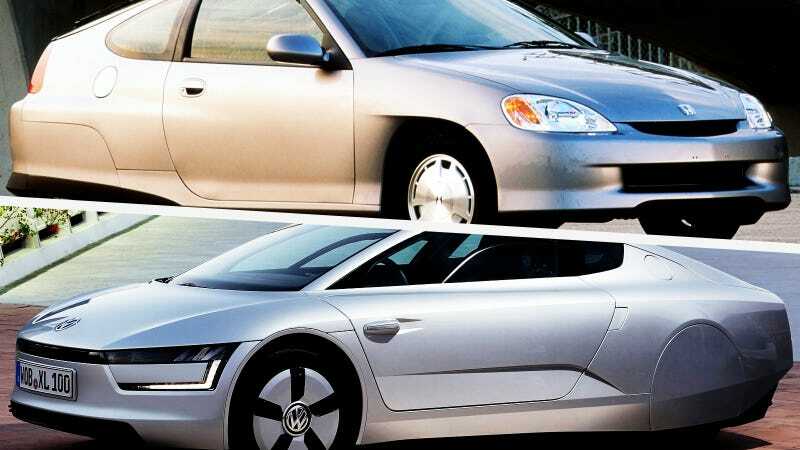 Honda not-so-recently revealed their model year 2000 Insight, and clearly it's a complete rip off of Volkswagen's XL1 eco car. The layout and concept of the Insight are so amazingly similar to the XL1, it's almost unbelievable that Honda would go ahead with this copycat design almost 14 years in the past. Look at how the Insight apes the XL1's two-seat layout, teardrop profile, and trademark rear wheel spats. Come on, Honda, you even copied the wheel spats? We still don't know if the dismal sales of Honda's impractical, slow, weird-looking hybrid will mirror the projected sales of the XL1, as well.